The scholarship finalists (pictured left to right): Christopher Martin, Martin Farms; Cole Ledford, Cleveland; Kara Stofel, Culleoka; Riley Bright, Rockwood; Mason Allen, Woodbury; Parker Bright, Rockwood; Hayden Campbell, Lowesville, VA; and Riley Reed, Lyles. 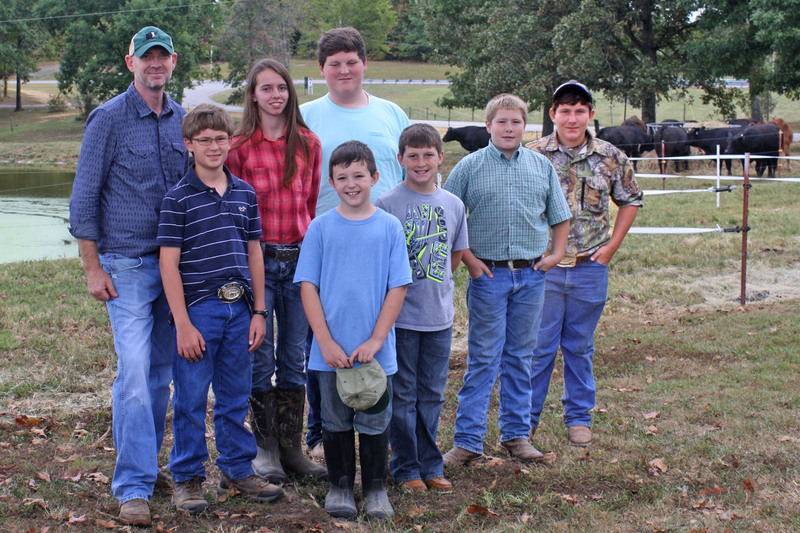 Five youth were awarded the Kenneth Ambrose Memorial Heifer Scholarship September 25 during the annual Martin Farms Open House at the Farm in Lyles, Tennessee. Seven finalists were chosen based on application and project scores, and panel each finalist faced a panel interview prior to selection of the winners. Martin Farms awarded three $1,500 scholarships with additional prizes added from Slate Farms & Cattle Co. of Vanleer and Water’s Edge Farm in Franklin. 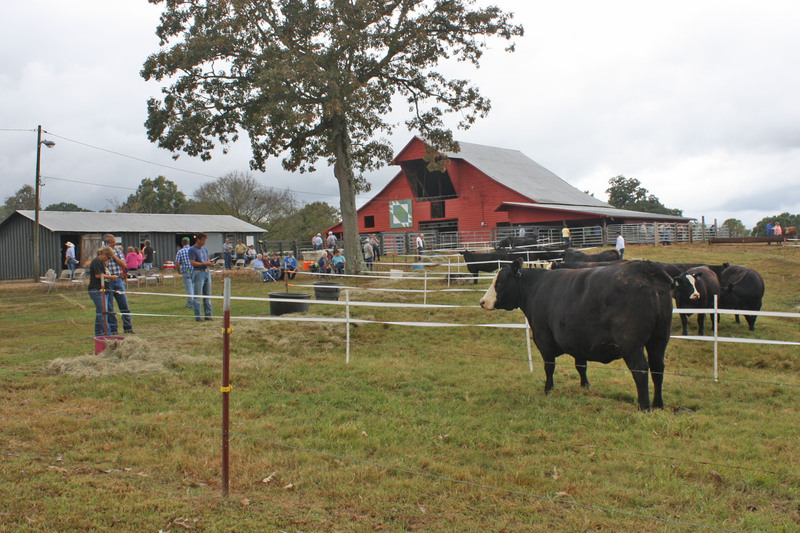 Winners applied their scholarships toward the purchase of a registered Simmental or SimAngus heifer from the Open House at the Farm consignments. 2015 scholarship recipients were Riley Bright of Rockwood; Kara Stofel of Culleoka; Hayden Campbell of Lowesville, VA; Cole Ledford of Cleveland; and Riley Reed of Lyles. Parker Bright of Rockwood and Mason Allen of Woodbury were alternates, each receiving almost $1,300 in voucher money to spend toward a heifer of their own during the Open House sale September 26. The Kenneth Ambrose Memorial Heifer Scholarship Program is an ongoing scholarship program founded by Neil and Christopher Martin of Martin Farms. Since 2006, a total of nineteen youth have received full or partial scholarships toward the purchase of a registered heifer. Additionally, sponsors have contributed several thousand dollars to provide vouchers to aid in the purchase of heifers by program alternates. Other supporters of the 2015 initiative include Performance Feeds; ABS Global; Barry Ellis and Accelerated Genetics; Genex Cooperative; Select Sires; Allied Genetic Resources; Farm Credit Mid America; Mix 30 Liquid Feeds; and Jane Herron State Farm. For more information about the Kenneth Ambrose Memorial Heifer Scholarship, visit Martin Farms online at MartinFarmsBeef.com or contact Chris Martin by email at seehimdesign@gmail.com or by phone at 931-580-6821. Registration and housing for the 2016 Cattle Industry Convention and National Cattlemen’s Beef Association Trade Show is now open. The 118th Annual Convention will be held in San Diego, Calif., Jan. 27-29, 2016. Advanced registration is open until Jan. 4, 2016. Convention participants will hear from industry leaders, gather insight on industry trends, enjoy an evening of stars and stripes on the USS Midway and this year’s Cowboy Concert Series will feature Martina McBride. NCBA President Philip Ellis said this convention is a must for everyone involved in the cattle industry. In addition to access to all of the 2016 convention events, registrants for the full convention will receive a 50 percent off coupon for Roper and Stetson apparel and footwear at the NCBA Trade Show. To register and secure housing for the 2016 Cattle Industry Convention and NCBA Trade Show, visit www.beefusa.org or e-mail meetings@beef.org. Follow us on Facebook and join the conversation on Twitter by using the hashtag: #beefmeet. The National Cattlemen’s Foundation is now accepting applications for 2016-17 beef industry scholarships sponsored by the CME Group. 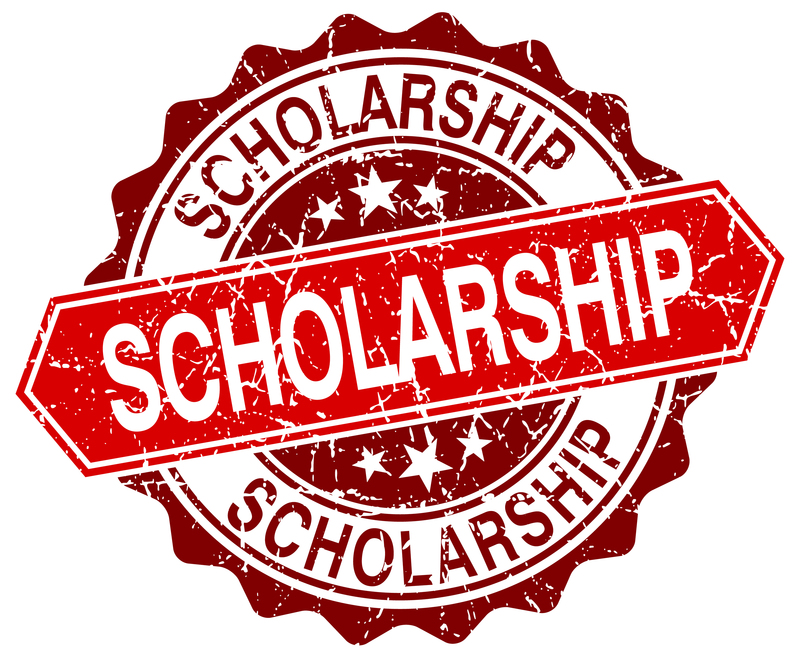 Ten scholarships of $1,500 each will be awarded to outstanding students pursuing careers in the beef industry. The CME Beef Industry Scholarship was introduced in 1989 to celebrate the 25th anniversary of the Live Cattle futures contract on the Chicago Mercantile Exchange. It recognizes and encourages talented students who will one day be industry leaders. Students studying education, communication, production, research or other areas related to the beef industry should consider applying for the scholarship. Applicants for the 2016-17 scholarship will be required to write a one-page letter expressing future career goals related to the beef industry. They also must write a 750-word essay describing an issue in the beef industry and offering solutions to this problem. Applicants must be a graduating high school senior or full-time undergraduate student enrolled at a two or four-year college. Applications should be submitted by October 30, 2015 and sent to National Cattlemen’s Foundation, 9110 E. Nichols Ave., Suite 300, Centennial, CO 80112. The winning recipients will be announced during the Cattle Industry Convention and NCBA Trade Show in San Diego, Cali., Jan. 27-29, 2016. A pocket-sized record keeping tool that has been used by cattle producers for more than 30 years to enhance profitability will be available for the 2016 year starting October 5 – at a reduced rate for a limited time. 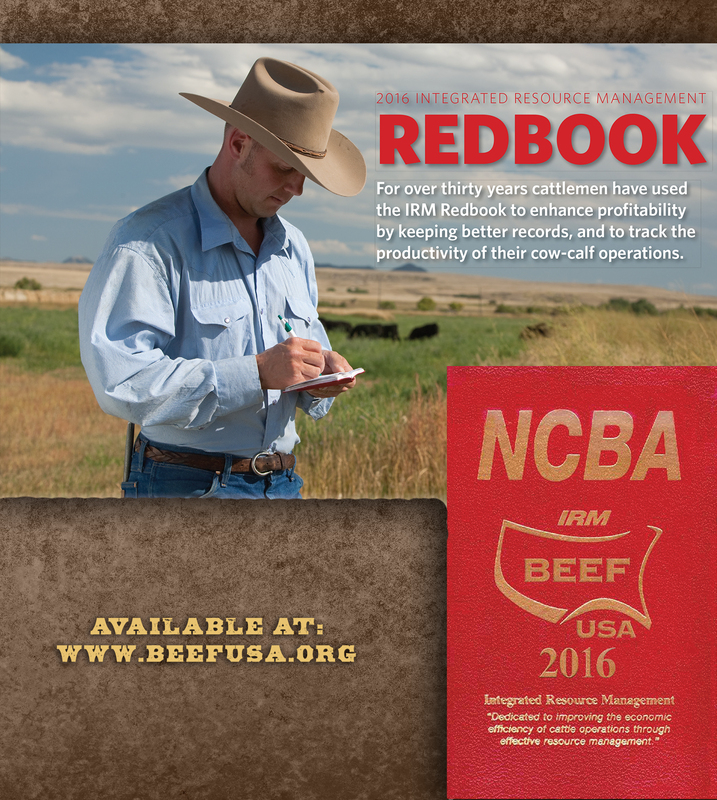 The Integrated Resource Management (IRM) Redbook from the National Cattlemen’s Beef Association helps cattle producers effectively and efficiently record their daily production efforts. The 2016 Redbook has more than 100 pages to record calving activity, herd health, pasture use, cattle inventory, body condition, cattle treatment, AI breeding records and more. It also contains an annual calendar, section for addresses, revised Beef Quality Assurance national guidelines, and proper injection technique information. Until Nov. 15 Redbooks can be purchased for $6.50 each, plus shipping. After Nov. 15 the price of the Redbooks will be $7 each, plus shipping. Customization of the Redbooks is available (for 100 books or more), and quantity discounts are available. To order, visit www.beefusa.org. For more information on the NCBA Redbooks, contact Grace Webb at gwebb@beef.org or (800) 525-3085.